Shawnee State’s Ashton Lovely attempts to perform a hesitation move on Thursday evening against Lindsey Wilson. 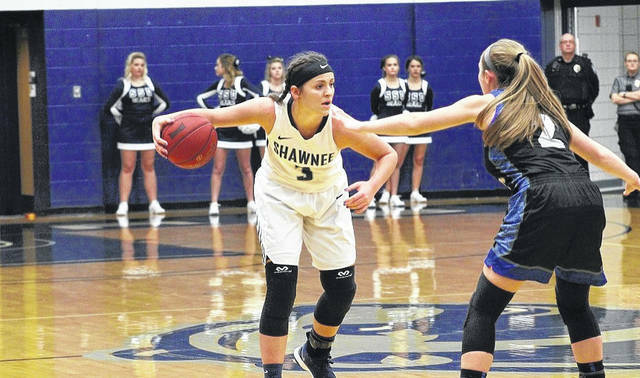 The Shawnee State women’s basketball program gutted out a Mid-South Conference win on Saturday afternoon, topping (RV) Cumberland (Tenn.) 57-53 at Waller Gymnasium. The Bears and Phoenix came out as cold as the Portsmouth weather in the first quarter, with neither team able to find much offense. Shawnee State was buoyed by Ashton Lovely (JR/Jamestown, Ohio), who scored all 11 of the Bears’ first-quarter points. After a pair of free throws from Kaitlin Oliver, Lovely hit a layup, then forced a turnover and hit a three to put Shawnee State up 11-6 with three minutes to go in the quarter. Cumberland responded with a pair of baskets late to make the score 11-10 after a quarter of play. Kerrice Watson scored to start the second quarter to give Cumberland the lead at 12-11, but Shawnee State immediately responded. Hannah Miller (JR/Coal Grove, Ohio) would finally be the second Bear to score a basket, Madison Ridout (SR/Jackson, Ohio) nailed a free throw and another Lovely three allowed SSU to go on a 7-0 spurt and take a 17-12 advantage. The score remained close, with a Micah Norris three cutting the lead to 19-18, but SSU ultimately responded with a 9-0 run capped by a tough finish from Sienna King (FR/Shelby, Ohio) to push the lead to 10. King then hit two free throws after a Watson basket to make the score 30-20 at halftime. Cumberland came out swinging in the second half, going on an 11-0 run to take a 31-30 lead right out of the gate. Shania Massie (JR/Greenfield, Ohio) nailed a three to give Shawnee State the lead back at 33-31, but the rest of the game proved to be a battle. Katherine Griffith connected on a pair of free throws late to tie the score at 38-38, but an Ashton Lovely three again saved Shawnee State as the Bears took a 41-38 lead into the fourth quarter. Shania Massie nailed a layup and Lydia Poe (JR/Jackson, Ohio) connected on the first of her two free throw attempts early in the final frame to push Shawnee State’s lead to 44-38. The Phoenix, however, managed to chip away at the lead, and a Kyra Tucker three tied the score at 46-46. Lovely got a shot to go to get the lead back for SSU, but another three from Micah Norris put Cumberland up 49-48. The Bears would not trail long, however, as Bailey Cummins (SO/Brooksville, Kentucky) connected on a pair of free throws to put SSU up, 50-49. From there, Shawnee State remained in control over the rest of the way. Hannah Miller got a tough layup to go on Shawnee State’s next possession to give SSU a three-point lead, and free throws kept the Bears up three until Kaitlin Oliver split a pair of free throws to cut the lead to 55-53. With less than a minute to go, Norris got called for a reach-in foul on Lovely, who hit one of her two free throws. Ant’Treasia Patton missed a three on the ensuing possession, and Madison Ridout hit one of her two free throw attempts to give SSU a four-point lead. Norris’ late three would fall short and Shawnee State escaped with the 57-53 victory. Ashton Lovely was Shawnee State’s only scorer in double figures, scoring 20 points while grabbing four rebounds. Hannah Miller and Sienna King each added eight for SSU. Kyra Tucker had 15 points to lead Cumberland. Kaitlin Oliver added 11 points and eight rebounds, and Janisha Lindsey had 10 points. The win improves Shawnee State’s record to 16-3 on the year and 3-0 in the Mid-South Conference. Cumberland falls to 12-6 and 1-2 in the league. SSU now leads the all-time series 8-6. Shawnee State returns to action on Thursday, Jan. 18 when the Bears hit the road to face Georgetown. Tip off is set for 6 p.m.